KARSTFLOW is a parsimonious mathematical model for simulating transient water flow in karst aquifers. 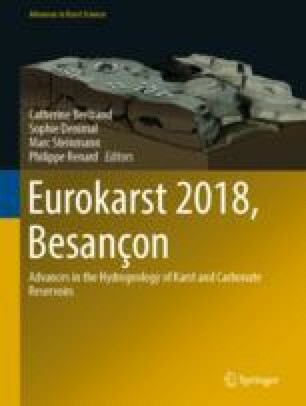 It is described here and adapted to rainfall-discharge simulation in karst modelling as a contribution to the Karst Modelling Challenge (KMC). The model is designed and intended for applications in which data are scarce and a parsimonious approach is thus required to model the system to ensure that the level of complexity of the model is commensurate with the amount, type and quality of the available data. Parsimony also requires the simplest model (least assumptions and minimum number of predictor variables) that is consistent with the data, which in this and similar cases are the functional dualities of the karst system: duality in recharge (diffuse and preferential), duality in flow (slow flow across the rock matrix via fractures and fast flow along conduits) and duality in discharge (slow flow and fast flow after recharge events). The methodology, which is completely general and can be used for similar aquifers, is illustrated by application to the karst aquifer in the Milandre groundwater catchment in Switzerland. This case study shows how the recharge model plays a very significant role in the results. In general, the results are acceptable with a Nash–Sutcliffe statistic value of 72%. This work was supported by project CGL2015-71510-R (Ministerio de Economía, Industria y Competitividad of Spain). We thank Pierre-Yves Jeannin and two anonymous reviewers for providing constructive criticism of the original version of this paper.